Kitsune is a supernatural creature called a fox-shapeshifter that possesses profound knowledge, long life and extraordinary powers. Her main power is the ability to take the appearance of a human. Most often, Kitsune turns into a beautiful girl who catches the eye of a man named Yoichi. Where will this union lead? Join the sweethearts as they work together to overcome obstacles and eventually learn that the most powerful magic of all – is True Love! 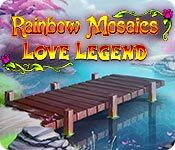 Rainbow Mosaics: Love Legend is rated 4.6 out of 5 by 11. Rated 5 out of 5 by zandu2 from What a treasure it is for me. I adore this little game. The whole layout of the game is beautiful, with a wonderful story to it and it's colorful too. It also has upgrade and trophies to collect. 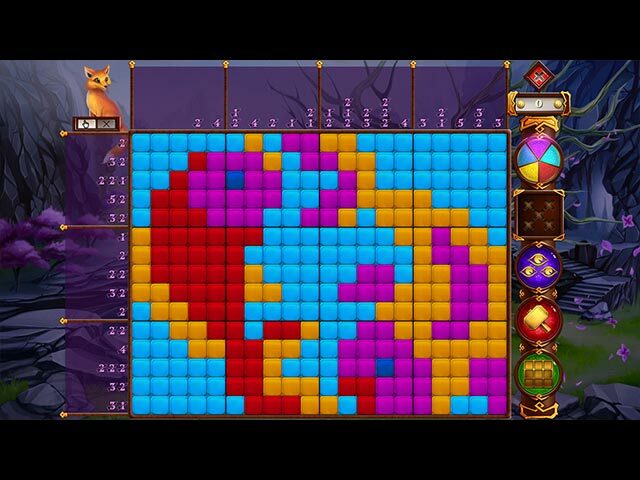 I found this treasure when i was looking for Rainbow Mosaic: Treasure Trip, Which is also a wonderful game.. Do enjoy for i truly recommend it to you all. Rated 5 out of 5 by Linda_in_Aussie from Challenging Mosaic Game This is a great mosaic game. Something different from the "penguin" series. I wish that the blank squares were a little darker though so it's easier to determine the difference. The storyline is somewhat irrelevant but gives the game some interest. But overall it's enjoyable and very challenging. Rated 5 out of 5 by LePhoenix from An Excellent Fun-Filled Tease Gorgeously therapeutic Nonograms, griddlers, mosaics, call them what you will..... I think they are one of the best workouts for the little grey cells and as with any workout, you want it to be fun and you certainly get that with Rainbow Mosaics who are sitting high above many; Paint it Back is my all time favourite (not available on Big Fish) with the Rainbow Mosaics being my first choice on here. Back to this game....Whilst the grids themselves are easily legible and uncluttered windows are a blessing, instructions on 'How to Play' are clear and concise too; so if you haven't tried of these games under the heading of Rainbow Mosaics yet, then please...please....pleeease do! Should you be a novice and still feel a little unsure on what to do then have no worries on that score because there is always help nearby in the form of hints and advice; you'll not find yourself stranded. I found this game to be well constructed and thought out with no guessing - every grid was solved on logic alone which is just how it should be; this current 'adventure' takes you on a beautiful journey and it's all thanks to an excellent development team, who get a well-earned big five star thumbs-up! The graphics are as we have come to expect meaning they are excellent for easing you further into that 'Ahhhh' relax mode we all of us seek to find sometimes; The accompanying music carries the Japanese theme along although I did find it rather repetitive as it's repeated in a very short loop, also it was a tad 'twangy' for me, but don't let that put you off this superb nonogram game...it's a winner! With some of these games the storyline can be poor at best but with this Rainbow Mosaic game you'll have a decent enough storyline that has been well thought out - personally, I feel this current game has given by far the best storyline of all. It's enchantingly heart-warming following a Japanese tale, I like that, it's like a bonus, isn't it? Not only have you a lovely game to play over and over again which is sure to give hours of enjoyment and pleasure, but you also get a brief insight into a magical Japanese tale that's enough to whet your appetite to want to learn more. To sum up, if you're wanting a lovely teaser while relaxing with a nice cup of something and feet up time, look no further, this is worth a purchase!. Highly Recommended! Rated 5 out of 5 by tjm1938 from Best of the genre The Rainbow Mosaics are BY FAR the best of this type of game that you can find. Lots of fun and challenge. I highly recommend this developer's mosaic games. Rated 5 out of 5 by pennmom36 from They Say Love Knows No Reason, No Boundaries, No Distance, No Foxes!? Rainbow Mosaics has done it again! Almost all other Mosaic Griddler games are worthless compared to this fantastic series. They even have a storyline that unfolds as you progress, and this legend unfolds in Asia when Yoichi, a young hunter falls in love with a beautiful "foxy" lady. Yoichi has fallen in love with a supernatural creature who possesses many powers, one of which is the ability to shapeshift! Nonetheless, Yoichi has fallen in love with Kitsune. One of my favorite features in Rainbow Mosaics is that you can choose from 7 different tile sets, my personal favorite is the lego style. You can also choose to play in Expert mode which only crosses off the numbers once the entire row or column has been correctly filled in, AND the powerups are disabled. There are 120 levels, and as you play each level, they will be available in the Freeplay section. As you correctly fill in squares, you will earn coins that can be used to decorate the Trophy Room or purchase upgrades for the Powerups which are hint forms that will increase in the size of coverage with each upgrade. The Eye Powerup will reveal the status of a random tile, the Hammer Powerup will allow you to choose which tile to reveal, and the Grid Powerup opens up a chosen area, all of which will not result in a penalty. Each time you upgrade a powerup, it increases the number of tiles it affects, and each powerup will show an example of it's current coverage. For those of you who have never played this type of game before, don't let it intimidate you. When I first started playing games I passed them by because they looked so complicated but they really aren't, and they are extremely addicting, enjoy! Rated 5 out of 5 by dachsy from Excellent Mosaic Game Just Like Its Predecessors This is similar to the previous games in this series 'Christmas Lights' and 'Blooming garden', as far as layout and game mechanics are concerned, just a different subject matter. If you liked the above games, then expect more of the same from this one. In the demo, I found that I never had to resort to using hints. i.e. solving is based on logic alone. If this continues throughout the game, then this game is a cut above the previous offerings, as I'm quite sure I had to do such in the final stages of many of the grids of those games. Graphics are great, nice bright, dense colours, 7 tile sets to choose from including a 'Lego' one and a nice 'stitched material' one. Music is eastern-themed, tolerable if you have it down low. Casual and Expert modes available, with the latter not having the numbers crossed out until the row is complete. Another excellent addition to this series which is becoming my favourite of the genre! Rated 4 out of 5 by verimeri from enjoyed it a lot I would have happily given this five stars except for one thing. It takes so long to get to the next little bit of the story I have pretty much forgotten what came before it. Other than that the puzzles and colors were great. 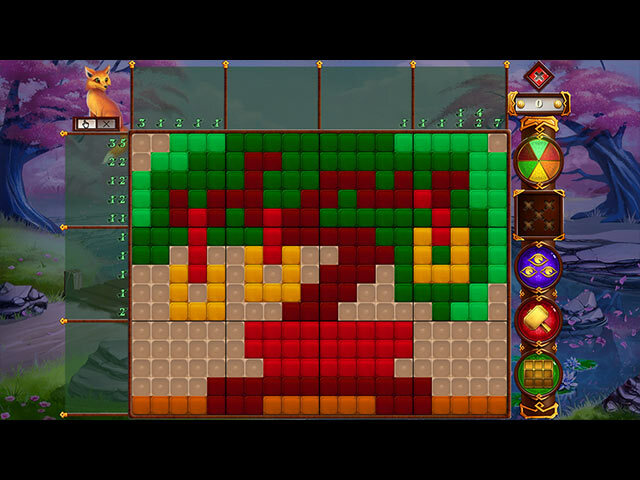 I also loved that I could click on the icon at the opening screen and simply play all 120 puzzles. Which I did after I finished the main game- Always determined to get perfect on every puzzle. Rated 4 out of 5 by JessF from Sadly, 5 levels required hint or guessing I enjoyed this, but gave it 4 stars because not ALL levels could be solved by logic. Levels 81, 91, 103, 115 and 116 required a guess or hint. The story line seemed pretty useless. While I would have enjoyed it as a novel or short story, it seemed silly here. I turned off the music. However, game play was smooth and colors bright. I did like the tile choices. In some the blues were too close. There seem to be more of these games coming out. Three new ones in the last week or so. Keep them coming. 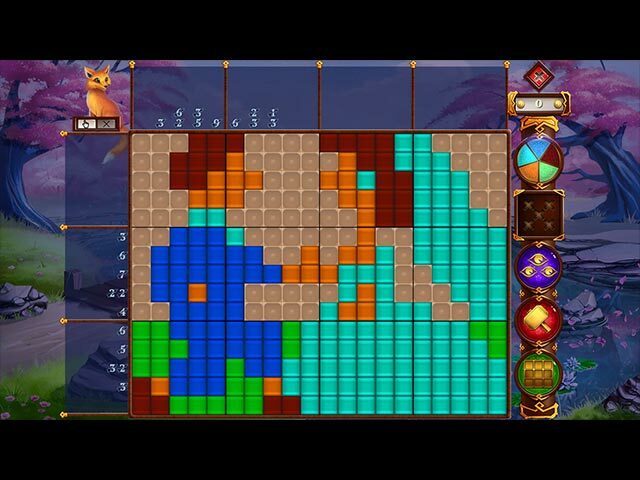 Join two sweethearts on a fantastic mosaic adventure and discover the magical power of true love!